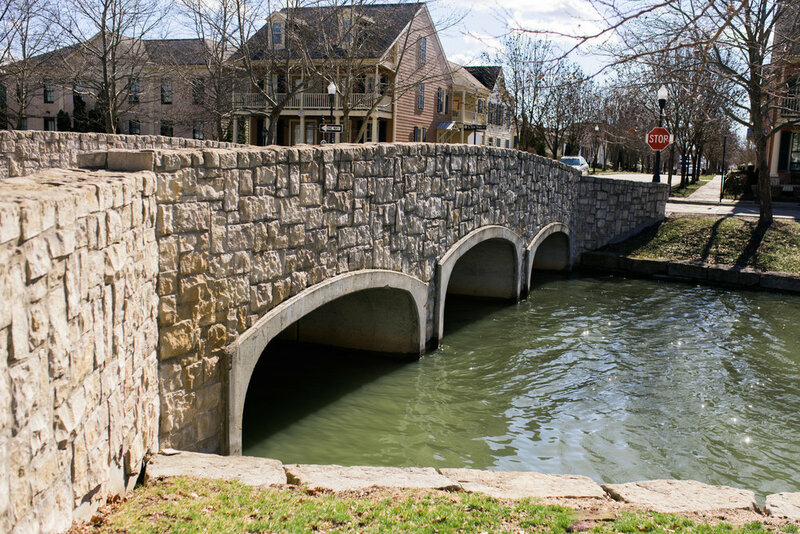 Tucked back on the north side of St. Charles, you will find New Town, a quaint new generation borough. You will find a Marsala’s, a quick grocery spot, a coffee house, wine bar, sand volleyball, man made lakes, dinning spots and a perfect spot to host your unforgettable wedding day! New Town offers two locations for your ceremony. First, the bright & airy chapel that seats up to 250 guests. Second is outside with the vast scenery behind you while you stand in front of New Town’s Grand Canal. I absolutely love the scenic view from the Grand Canal. There is plenty of space for up to 250 guests in both ceremony options. 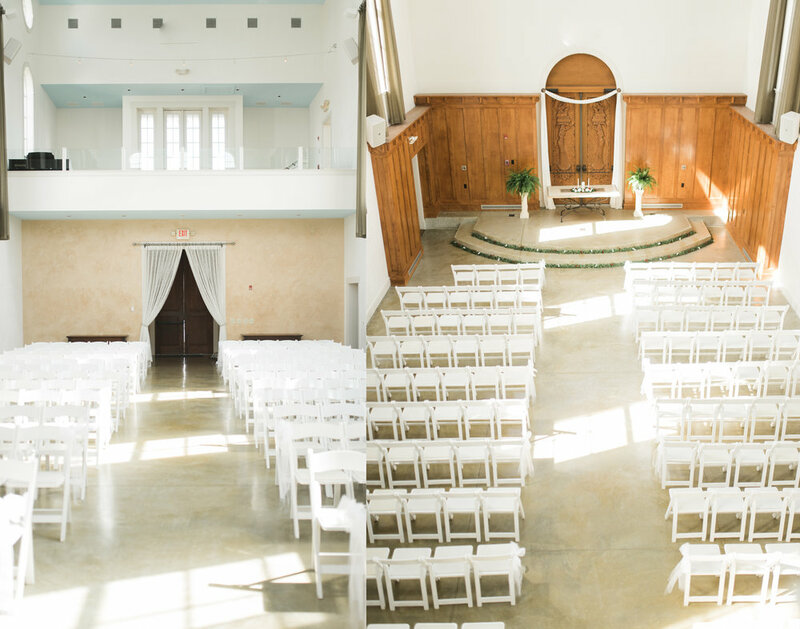 The best part of the Wedding Chapel is the large vast 2 story windows letting in gorgeous sunlight for the perfect light & airy feel. The wood work on the doors behind the altar steps, create a unique backdrop. There is also plenty of spots to place any floral arrangements to enhance the beauty of the chapel. Designed with your favorite colors and decor, this space can be a magical spot to say “I do!”. After you fall in love with the chapel, you look up to find it has a balcony! From that angle you can capture the entire aisle and everyone there. This is the perfect spot to score some seriously romantic pictures. I mean…look at these gorgeous pictures…. The balcony also serves as a fun kiss shot! One of my favorite things about venues is when they can host the ceremony AND the reception! 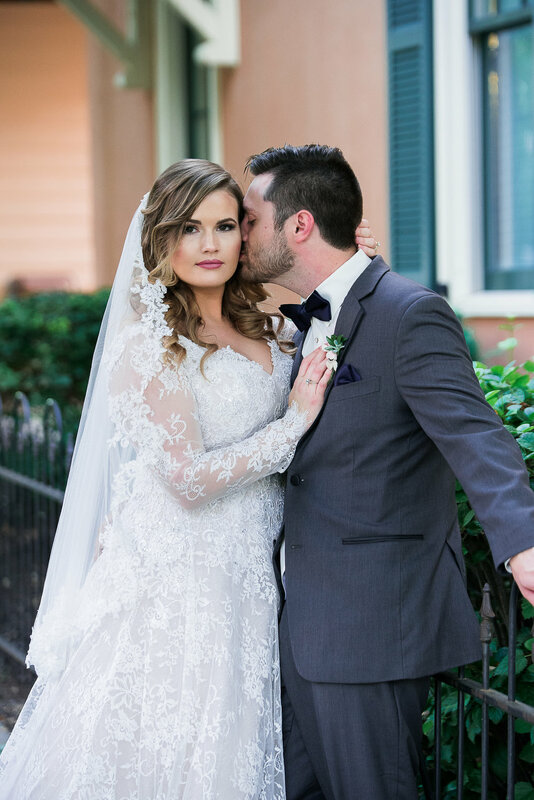 Who doesn’t love a one spot wedding that also has perfect picture locations?! After you get married in the chapel or in front of the Grand Canal, you can move to their Event Tent for your reception of up to 350 guests. You have to freedom to decorate as you wish and included there are beautiful chandeliers and rope lights to add to the charm of your reception. They work exclusive with the delicious FrenchTown Catering who will handle all of your food needs. After serving two weddings here, I can personally tell you the food choices will not disappoint! Honestly, I can not say enough good things about New Town Weddings and Events. They execute flawless weddings and providing couples with a dream wedding day. 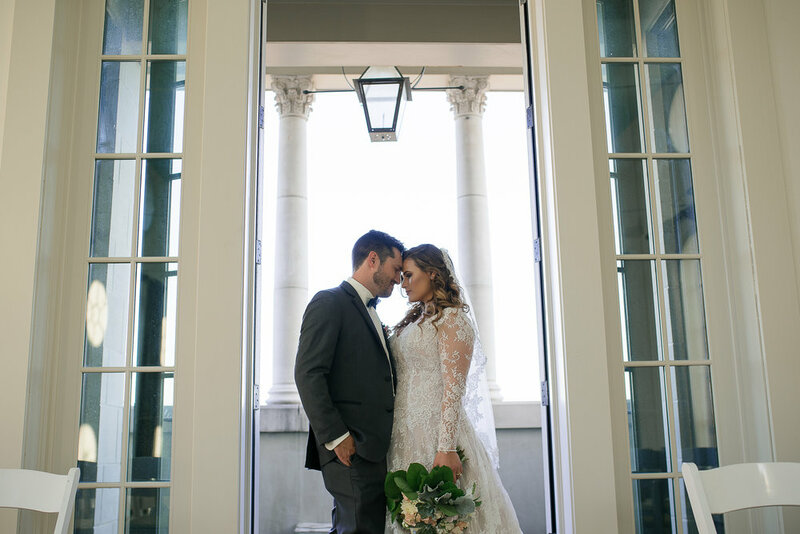 If you are still shopping for your 2019 wedding or getting ready for your 2020 wedding, New Town is a beautiful wedding location. You can just host your ceremony, just your reception, or plan both there! Prices vary from starting at $300 for just ceremony and $2,000-$3,000 for your reception. Now to see all the beautiful places to capture your wedding when you plan your New Town wedding.